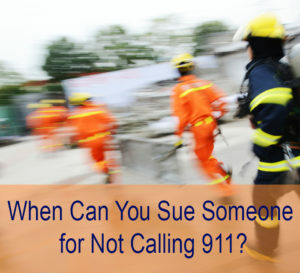 When Can You Sue Someone for Not Calling 911? If someone is injured or you see an emergency, it only makes sense to call 911 and alert the proper authorities. But, if a person does not call 911 when medical attention is clearly needed, can that person be sued? The answer is not as simple as a “yes” or “no”–and while there are theories, you should always consult with a personal injury attorney just to be sure. Often it comes down to the circumstances and why a person would call 911 or if there was a legitimate reason to call. Is Not Calling Considered Negligent? If a person does not act reasonably in an emergency situation, then he or she could be liable for the injuries caused. This is referred to as negligence, which means a person owes a duty of care to someone and if they fail to provide it, they could be in breach of their duty. If you are already injured and someone does not call 911, then you may be able to sue them for any additional injuries you encountered because of that delay. For example, you are injured at a person’s house and he or she will not call 911. You are forced to walk to a neighboring house to call 911 and suffer from cardiac arrest because you were walking while injured. The person who refused to call 911 when you clearly needed medical attention the first time could be liable for the damages of your cardiac arrest. Was There No Duty to Rescue? The average person walking by or a person who witnesses an accident does not always have a duty to help or rescue another person or even call 911. If there is no duty owed, then that person cannot be sued for not calling 911. Starting the rescue. If someone starts to rescue you, they already have an obligation to continue; therefore, if they start to help, they are also obligated to contact 911. If that person put you in the dangerous situation, they have a duty to call 911. You and the other individual have a special relationship, such as an employer and employee. If you were injured because someone failed to call 911 or you feel your injuries were made worse because someone failed to act, then you will want to speak to a personal injury attorney. Click here to contact Leifer Law Firm today for a free consultation regarding your personal injury case and we can tell you right away if you have a valid claim.